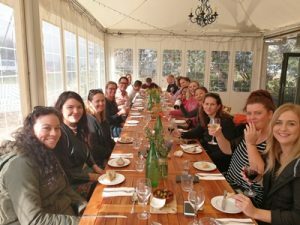 Small group touring specialists, Bunnik Tours, hosted a mystery day-trip famil for 40 travel agents in NSW on 16 May 2018. Business Development Managers, Walter Delorie and Lachlan Burnet travelled with the group up the NSW coast in two groups of 20 to give agents the Bunnik Tours experience of travelling in a small group of just 20 passengers on a full-size coach. The groups enjoyed a guided tour of Sydney’s Q Station in Manly, followed by a delicious three-course meal in Palm Beach before concluding at Sydney’s Central Station. Picture: The group enjoying lunch at Dunes Restaurant, Palm Beach.